It’s a question that permeates our existence. What does it mean to be alive? Is it our heartbeats? Is it our emotions? Is it that we breathe? What, exactly, does it mean to truly be alive? These are the underlying questions that confront those journeying into the beautiful adventure of Nier: Automata. With humans on the verge of extinction and hidden away on the moon, the earth is populated by a hivemind of machines – the creatures, controlled by aliens, responsible for the destruction of mankind. Androids, servants of the humans, operate out of a lunar command center and make forays into the ruinous territories of earth. In doing so, they run operations against the machines and for the earthly resistance, uncovering the mysteries of human extinction, the alien disappearance, and the reasons why machines all act differently. 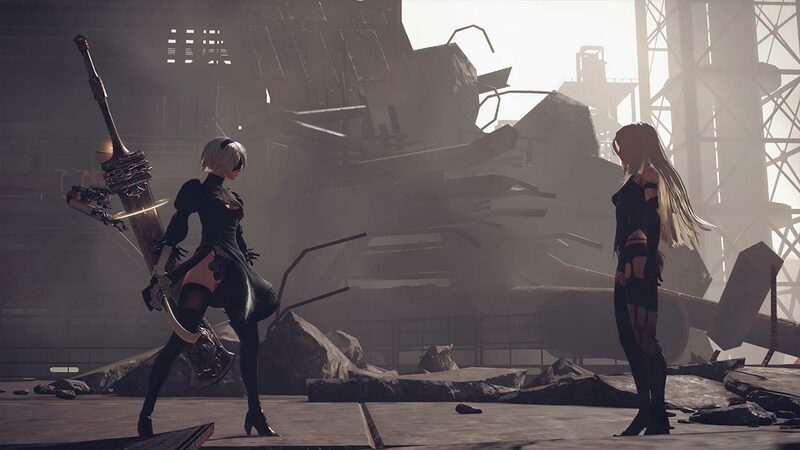 The player takes the role of 2B, a combat android sent to earth with 9S (her android seeker companion) in an effort to assist the android resistance against the machines. During her journeys, however, she discovers that not everything is as it seems – or at least as command would have her believe. Some machines are docile, unwilling to attack unless provoked. Others are terrified of androids, pleading for their mechanical lives. And then there are others yet, red eyed and ready to swarm 2B and 9S and fight to the death. Her ventures through earth help her piece together the reasoning why these machines act the way they do – and what really happened to the aliens and humans. 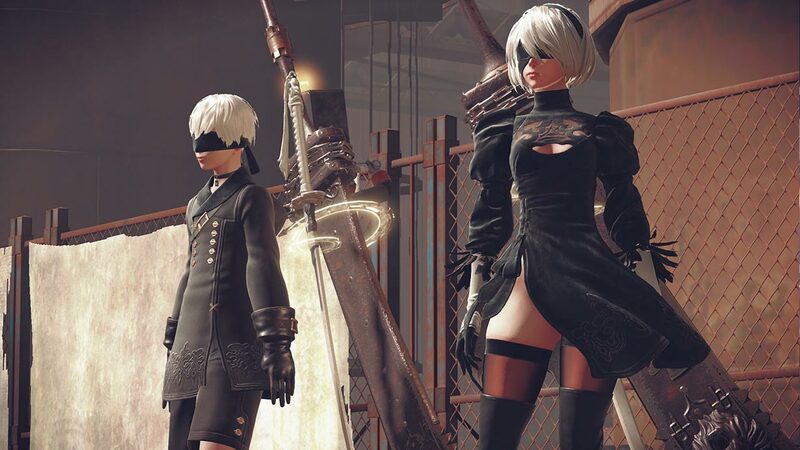 For those new to the world of Nier and Drakengard, Nier: Automata may appear terribly confusing; hell, it’s confusing for veterans of the series. To clarify, Nier: Automata takes place many, many years after the happenings of Nier (or Nier: Gestalt). In order to truly get a decent grasp on just what exactly is going on in the expository world of Nier, one must complete the game multiple times with multiple endings. But don’t worry – the process isn’t painful, most cutscenes are skippable, and the combat is extremely fun (plus, and avoiding spoilers, your second and third run throughs are ultimately played very differently). Gameplay in Nier: Automata is a grand step forward for the franchise. During Automata’s reveal, it was announced that Platinum Games, masterminds behind Bayonetta and Transformers: Devastation, would take over crafting a new combat system – and, boy, did they do a tremendous job. Where Nier’s combat, while still solid, felt choppy and a bit sloppy, Nier: Automata gives players the freedom to experiment more in depth with weapons and combos, creating a fighting style all of their own. Combat is fluid and fast, and 2B can flash around areas, unleashing devastating combos on her foes. Additionally, Nier: Automata adapts its gameplay during various aspects of main story missions, giving gamers almost a new experience during each mission. For example, the opening mission in your flight suit has 2B blasting through the skies in a Galaga type, over the head, flight shooter. Likewise, 2B rushes through levels in the style of a side scrolling action game or an over the head twin stick shooter in tandem. There’s even an awesome boss battle that takes place like a fighter game (think something similar to Street Fighter). Add to that innovative mixture a hacking and hate system later, and Nier: Automata keeps its gameplay extremely fresh. And that’s just the combat. During 2B’s adventures, the player can partake in any number of activities. Of course, the narrative and main story missions are priority, but Nier: Automata offers a plethora of unique side quests, fishing, exploration, weapon discovery and upgrading, and more. Visuals in Nier: Automata also feature a huge upgrade for the franchise. Nier was docked some points by many critics for being ugly. I found charm in the aesthetics, but it’s safe to say that Nier: Automata took the criticism to heart. While Automata certainly isn’t the best looking game this generation, its colors are vibrant (especially on my 4k television), and its character models are sound. The combat sequences are also dazzling to view, all leading to a very pleasing aesthetic experience. To continually keep the game fresh, the visuals change based on your location; for example, when at the bunker command center at the lunar base, 2B’s setting is a mixture of grays and blacks, shades to, perhaps, tell a different tale of 2B’s home base. And while gameplay and visuals make for a great experience, the true beauty of Nier: Automata is in its phenomenal soundtrack. In my Nier review, I noted that its soundtrack was near immaculate, fitting the game better than almost any other soundtrack I’ve heard. In Nier: Automata, the same rings true – the soundtrack is incredible. Once I stepped foot into the resistance base and was hit was the folk acoustic guitar and soft melodies of those female vocals, I smiled. It was like I never left Nier, one of my personal favorite games, and felt right at home. The frustrations I felt dying and replaying the opening sequence washed away, and I remembered why it was that I was so excited for Nier: Automata. Nier: Automata is a great game; it’s one of the best I’ve played in a long time. That’s not to say, however, that it is flaw free. Frame rate issues plagued me a few times, which could be deadly in combat. Camera angles can also be messy, which had negative consequences on my otherwise enjoyable combat experiences (like I’m sure I dodged an attack, only to be annihilated by it anyway). Additionally, I came into a glitch that had me stuck in various parts of the ground, requiring jumps to free me. Before I could reach a save point or an area where I could save, my game crashed. I lost about an hour and a half of gameplay. Overall, however, Nier: Automata takes a spot early in my game of the year race. It’s gameplay and visuals are much improved over its last iteration, and the sound in the game is superb. Following Nier: Automata’s narrative can be confusing, but it’s often rewarding to see it fully through (not just one ending). It’s a game that action RPG fans need to play, and those who enjoy a good Platinum Games experience will be right at home. In a month where the Nintendo Switch and Zelda: Breath of the Wild released, Nier: Automata stands tall and proud – and, for me, the king.